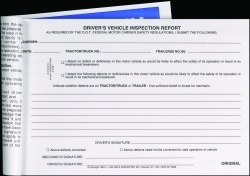 Simplified Driver Vehicle Inspection Reports are simplified versions of Detailed DVIRs with 15 inspection areas and room to record any defects. These Simplified DVIRs are available in book or snap-out formats. 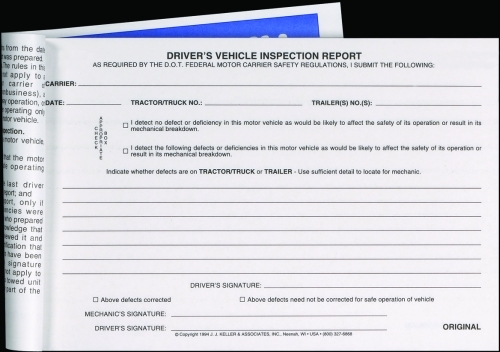 Book formats include key regulations printed on inside front cover to remind drivers of DOT-required procedures. Book format can be a choice of either 2 or 3 plies, with carbon or carbonless, stock or imprinted forms. Each book has 31 sets of forms. Size 5 1/2" W x 8 1/8" L detached. Snap-out format available only 3 plies, with carbon or carbonless, stock or imprinted. Size 5 1/2" W x 7 3/4" L detached. All Simplified DVIRs are available in 2 page orientations: Vertical and Horizontal Format. All imprinted DVIRs are available here.